If you look closely at my picture, you’ll see it’s of a bundt cake. I made it yesterday to celebrate the safe return of my friend’s son. He and four friends were camping in the mountains of Utah last weekend, when weather blew in and they found themselves stranded. Long story short, parents alerted the Sheriff and after a failed attempt to locate them by snowmobile patrol on Sunday, a Search and Rescue helicopter was dispatched Monday morning. Thank g-d and beyond, around noon they were found. I baked a bundt cake, because when my friend’s son graduated from HS last Spring, I baked six different bundt cakes, with made up names and flavors, for his party. This time, I made up another one in his honor, but the top and sides didn’t fully come out of the pan. I delivered it anyway. It seemed to me the perfect metaphor for his ordeal. In the card I wrote: As we know, things don’t always go as planned. 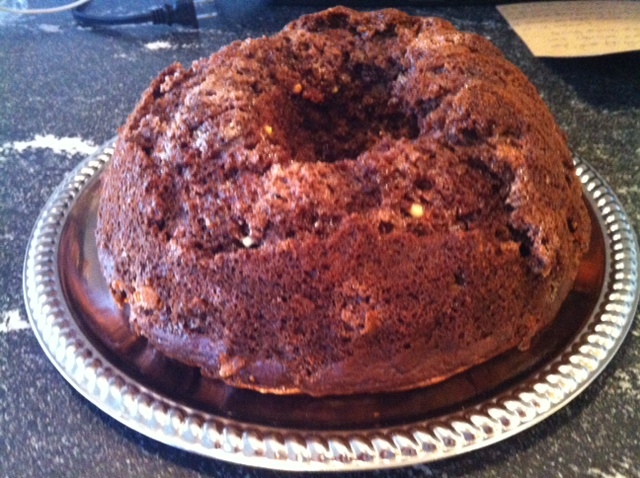 In celebration of your safe return, I had to bake you a bundt cake. It didn’t come out so well. Rather than consider it a flop, I offer it still. Seems it’s like life – it can be looked at in so many ways, and in doing so, we can still find the yummy parts. Instead of slicing the cake, maybe crumble it into bowls with ice cream? And there in my own words to him, I realized that I had been stuck in all that “wasn’t” in Thanksgiving/Holidays. Something in me shifted and I was inspired to find the yummy parts, even though my metaphorical “Holiday Cake” didn’t look like I thought it should. And then, as if by miracle, something crazy happened. Spontaneity and delight took hold and within an hour, the first night of Chanukah had a plan. A few hours later, with ease and overcooked latkes, we found ourselves sitting around the dining table with our friends (who treat my daughter with such love) and laughed as she opened their generous gift in the glow of the menorah. 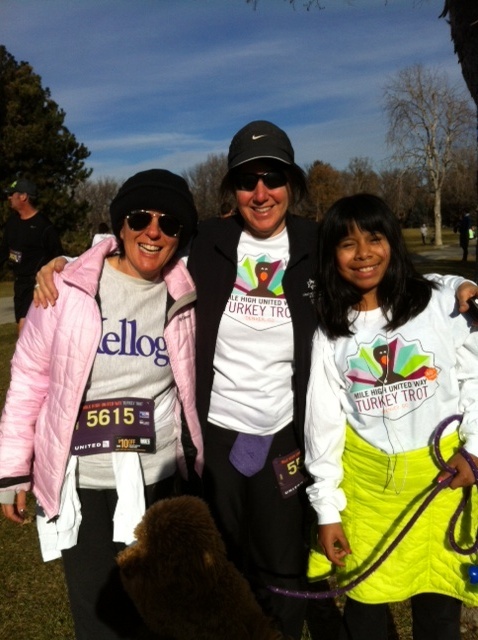 Then this morning, one of them, Ellen, encouraged us to spontaneously enter the Turkey Trot. As we trotted around the park, I told her what was happening and she wisely said, “Sometimes what you think something should be, isn’t’ really what you want anyway, is it?” Woa. And there she had it. Forced to get real with myself, my gratitude actually welled up. It’s so easy to think things should be a certain way. That I should be a certain way. And then I reminded myself of something I have always known, but in my own vulnerability had forgotten…I do have a lot of what I want, it just may not look… a certain way. Once I shifted my perspective, I began to see G-d winks (little miracles of love) everywhere. I see it in this picture my cous-end (cousin who is like a friend) just sent from Boston. 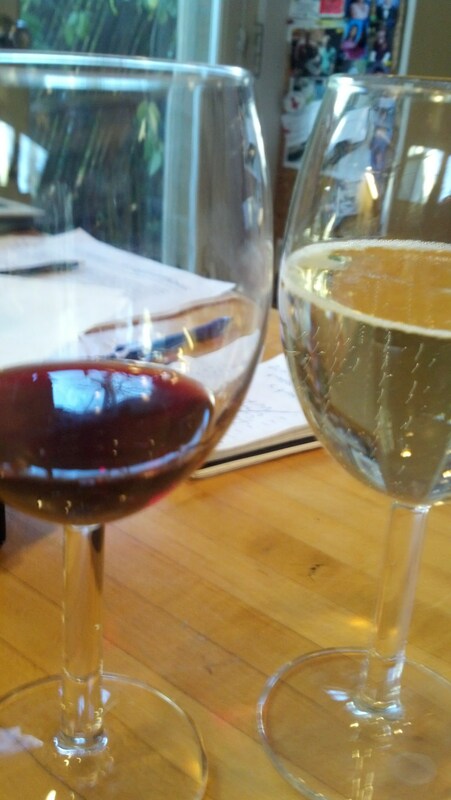 She poured a little wine in a glass and put it on her counter, so as to have me there in Spirit. My list could go on…and will. So much has already happened in the last 24 hours to kick-off the season with a light and great-filled heart. Tonight, I will hold hands with my own small family of 3 and revel in a delicious dinner at a beautiful restaurant. There will be no dishes to do…only a delicious “Holiday Cake” to enjoy. How do you MindFULLY find ways to be Great-FULL during the Holidays?